All of us have an obligation to protect athletes from concussion: know the signs and take action if you suspect a brain injury. As a society, we have become more and more aware of the danger posed by concussions. But did you know that Washington was at the forefront of protecting young athletes from the dangers of multiple concussions? In 2009, Washington state Governor Christine Gregoire signed into law the toughest “return-to-play” law in the country — The Zackery Lystedt Law (RCW 28a.600.190). In 2006, 13-year-old Zackery Lystedt hit his head while making a tackle for his junior high school football team. An injury time out was called, but he returned to the game minutes later. After the game, Zack collapsed, and was airlifted to Harborview Medical Center. He had suffered a severe brain injury. He spent 93 days in the hospital, three months in a coma, and underwent multiple surgeries. The athlete cannot return to play until the athlete has been evaluated by a licensed health care provider trained in the evaluation and treatment of concussions and receives written clearance to return to play. 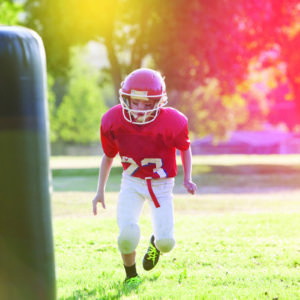 With many young people participating in sports year-round, coaches, teachers, parents, and athletes need to be aware of the danger of concussions. Multiple concussions can cause a lifetime of symptoms. For more information on youth concussions in sports visit the “concussion” tab on the Centers for Disease Control website at www.cdc.gov. If you or a loved one has sustained a head injury and you have questions regarding the Lystedt Law, call Abeyta Nelson Injury Law to schedule a free, no-obligation consultation. There is never a charge to discuss your questions with us, and no fee unless we win your case. The sooner we are involved, the more help we can give you.